The Siena Hotel, named after a small city in Italy and inspired by a Tuscan Villa, creates lifetime memories through personalized service and unparalleled dining. We connect with travelers who share a love for life and an appreciation of the journey. At The Siena, we offer our patrons an electric experience – a fusion of architecture, intimacy, and culinary artisanship. When we set out to build the Siena, there was one central idea. Make every room look and feel like a world-class luxury boutique hotel. We could have built more rooms in the same space, but we decided on just 79. Seventy-nine very special, well-appointed sanctuaries, with space to stretch out, relax and forget the cares of the day. Each room is individually appointed, each with its own décor. All of the rooms and suites are very spacious with 12 foot ceilings, Juliet Balconies, sitting area, large marble bathrooms and modern amenities. 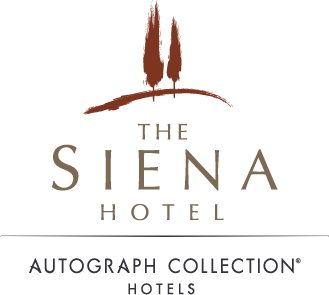 Click here to read more about The Siena Hotel’s accommodations. The Siena Hotel is conveniently located 1.5 miles from downtown Chapel Hill and UNC-Chapel Hill, and 15 minutes from RDU International Airport, The Research Triangle Park and Duke University. Find entertainment, fine dining, shopping, nightlife and attractions nearby. Touted as the “Southern Part of Heaven” by artist William Meade Prince, Chapel Hill has the ability to cast a spell on anyone who cares to experience this town’s unique blend of cosmopolitan culture and Southern hospitality. The appeal of Chapel Hill is magnetic. Rich in history and steeped in tradition, this Southern college town attracts newcomers from around the country in all walks of life to experience its magic. What they invariably find in Chapel Hill is a diverse and invigorating culture that feeds the minds and souls of its inhabitants. And, more importantly, what they find is that they never want to leave.